Back in April, word leaked out that a mystery assortment of six Joes was being prepped for release. They were Generation 3 molds, painted like '90s versions of the characters and packed on unique cards. There was much debate about what the figures were for, with rumors ars varied as "these were planned releases but are cancelled" and "it's a preview for the movie toys," but the truth turned out to be much be what Generals Joes reported at the beginning: they were made exclusively for dollar stores (though good lord did some people have a hard time accepting that! Yeesh). The figures are sold on a 5" x 7" card that features a metallic version of the GI Joe logo in front of a weathered Arashikage Clan symbol. It's a nice look, to be sure, but why is the actual card so big? The last time Joes were packed for Market Six, the cards were barely larger than the figures they held - it was economical and environmentally friendly... but maybe it was too easy to overlook the figures, or for shoplifters to pocket them. Who knows? The back features a stock layout of all six figures in the assortment (along with a 2011 copyright date, suggesting these have been in the works a while now), but no specialized info about whichever figure you get. 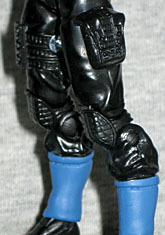 Snake-Eyes honed his combat skills as a Long Range Recon Patrol trooper in Southeast Asia and perfected his mystical martial arts techniques with the same Ninja clan that produced Storm Shadow. Although he is as equally adept with submachine guns as he is with swords, Snake-Eyes is most dangerous and unpredictable when he's armed and cornered. When Hawk went to Snake-Eyes' cabin to recruit him for duty with GI Joe, the silent Ninja was out hunting rabbits - bare handed! Now, as we said, the back of the card has no individualized copy - so that means no filecards. So that big chunk of text you just read (or maybe glossed over because we've conditioned you to know that the italics at the start of our reviews are always just biographical copy from the back of the box) isn't actually anywhere to be found. Where, then, did we get it? It's the filecard of the figure that inspired this one. By the '90s, Hasbro's market research showed that kids liked bright colors on their toys, so the figures began trending that direction. 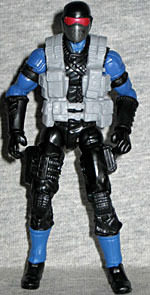 In 1991, Hasbro released the fourth Snake-Eyes, and he was wearing a new uniform: a blue shirt with black and grey vest; black gloves; black pants with blue stripes on legs; black boots with blue shin coverings. Rather bright, compared to his previous looks. This figure has the arms from the "Pursuit of Cobra" Action Feature Storm Shadow that nobody ever bought, so they might as well be new. The rest of his body comes from the "Version 3" G3 Snake-Eyes, aka the super-commando suit, which I'm really wishing we'd reviewed at some point, if only for the number of times we've had to refer to it because it's been repainted into something else. It's not a perfect choice for a base body, because the knees don't extend fully, and there are holes on his chest and waist where there are now no costume details plugged in. The head comes from the awesome POC Snake-Eyes that everybody loved, but it sits a little low on the neck joint - it might be fine if he didn't also have large webgear that hovers above his shoulders slightly, making him look stumpy. The face is remarkably close to the original, just lacking the blue frame around the red goggles. The webgear/vest is the same one that came with Night Fox, but it really captures the look of the 1991 figure's sculpt very well. Certainly as much as any other random G3 repaint captures the look of the figure that it mimics. His only accessory is a katana - black, sadly, not the pinkorange of the old toy. He also gets no submachine gun. Clearly, cutting the number of accessories is one way Hasbro is keeping costs down on this small line. And yet we still get a display base, so that's nice! These figures allegedly came out around the same time as the Retaliation toys, but dollar stores don't have the same high commitment to shelving new product that Target or Kmart do, so the odds of your finding these are still pretty low. So far these are only available at Dollar General stores, nowhere else - I have six DeeGees in my shopping loop, plus a few others if I branch out, and none of them have the figures yet. 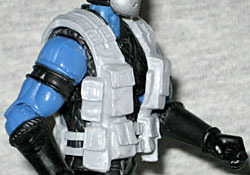 I'm just now seeing the first price tags beginning to appear as the Rise of Cobra Combat Heroes get clearanced away. 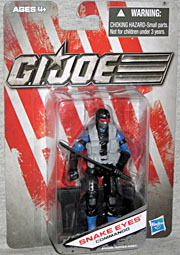 After years of the '80s being the basis for nearly every GI Joe toy update, it's a nice change of pace to see the crazy '90s designs get some attention. And some redemption.